History: Mr Pefanis - Vassilatos was asked by the Cretaquarium to dive into the aquarium tanks for maintenance and inspection reasons. After some months of working in the aquarium, he managed to indentify the procedures for safe aquarium diving and the work that has to be done there. 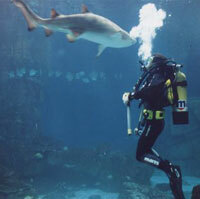 Also he managed to see which diving skills must be mastered by a diver in order to be a compentent aquarium diver. The last work resulted in achieving the PADI Distictive Speciality for Aquarium diver, something that has been done for the first time in Greece.